Paul Weller appears on "The Wire" soundtrack! – Paul Weller News! Paul Weller appears on "The Wire" soundtrack! Paul Weller’s version of I Walk On Gilded Splinters is featured on the soundtrack to one of the finest shows HBO has ever produced called , “The Wire.” The show is a gritty drama set in Baltimore, Maryland. The track was featured in the final episode from Season 4. The Wire: “…and all the pieces matter.” – Five Years Of Music From The Wire’ includes all versions of the show’s opening theme song – Tom Waits’ ‘Way Down in the Hole’, as well as versions by The Blind Boys of Alabama, The Neville Brothers, and DoMaJe. 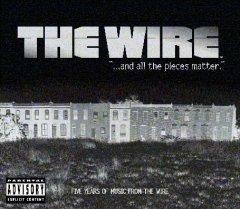 The deluxe collection from The Wire also includes several tracks of dialogue from the show. The CD booklet also includes essays by writer George Pelecanos and hip-hop journalist Jeff Chang. Next Entry Yep Roc to release "Wild Wood" Deluxe in the USA!